I have known Erick Reidell for several years, but he and Geoff go way back to high school. Erick has always been an adventurous, creative, gregarious person, and we found a lot of artistic common ground to talk about when I first met him as Geoff’s new girlfriend a little over five years ago. Which was a relief to me, since I just wanted Geoff’s friends to like me! It was a shock to everyone when he was diagnosed with cancer that same year. Cancer cruelly seems to always pick on the best, most wonderful people. Erick would not be anyone’s “typical” cancer patient. He doesn’t smoke, lives healthfully and is always full of optimism and cheer. That first year Geoff and I were dating, Erick had a seven-pound tumor removed from his abdomen. There were many breathless months while Erick endured chemo and treatments and recovered from surgery. I vividly remember the night Erick’s wife called Geoff to tell him that the most recent scan had come back clear, and for the time being at least, Erick was in remission. Everyone was, of course, extremely relieved. Since then I’ve gotten the chance to get to know Erick better myself, and I can say he is one hell of a guy. Hard-working, artistic, funny, a great husband and dad and always ready to face the next challenge his body throws at him. He is such a lovely man that I suggested he become ordained online so Geoff and I could have him marry us at our wedding, which he did. 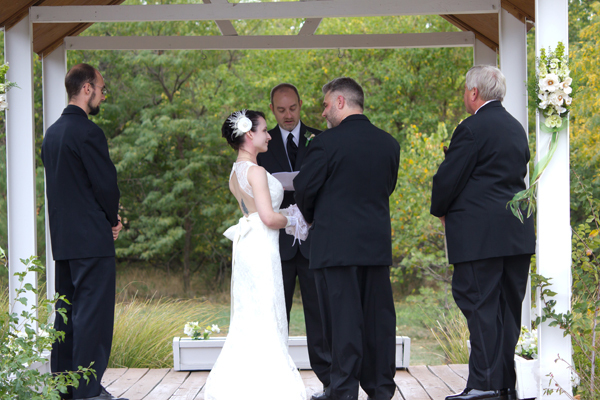 The wedding was, of course, a wonderful, beautiful blur of a day, but it will always mean so much more looking back and remembering it was our dear friend, and not some stranger, who performed the ceremony. Alex/my man of honor, me, Erick, Geoff and Geoff’s dad/best man, Larry. Late winter, after several years of being clear, Erick’s cancer once again returned, and once again, he beat it. Not without great effort from him and his doctors, but he did it. When we knew we’d be seeing each other over Christmas, Erick asked to be a part of DreamWorld, which I gladly said yes to. I also felt that a very serious charge had been given to me. I wanted to make sure I did something special for Erick, something true to DreamWorld, something that spoke of his struggles and also something that would ring true to other cancer sufferers. Out of these swirling thoughts came the Yellow Knight. Yellow, since that color is associated with cancer-awareness ribbons, LiveStrong bracelets and the like. His armor is made out of little bits and swirls of ribbon (or paper, as it ended up, but it looks like ribbon) much like the awareness ribbons. Though ribbon would seem like a frail and flimsy defense, he defeats the horrible cancer-monster. 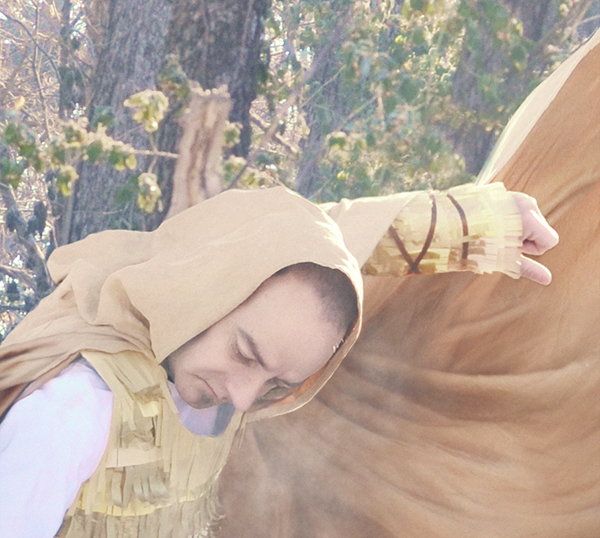 I’ll talk briefly about how I made Erick’s costume on, again, a next-to-nothing budget. 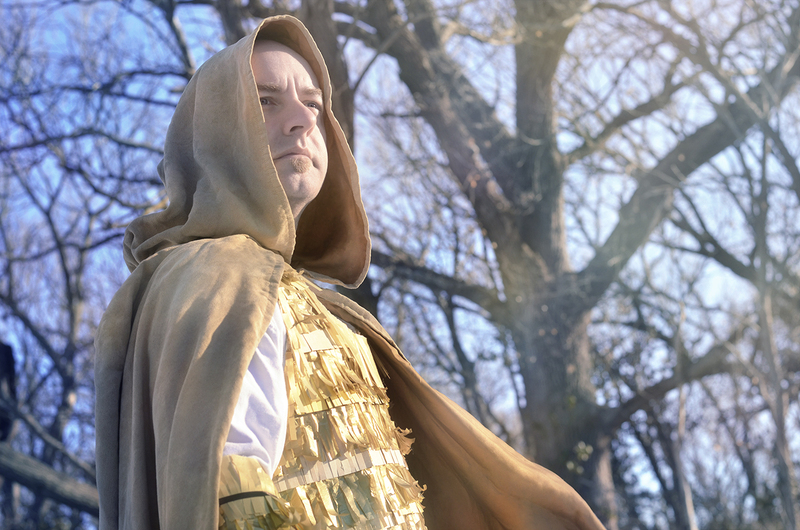 His cloak was the same one I’d used in Paul Telfer’s Sleeper’s Sentinel photos, so that was already made. 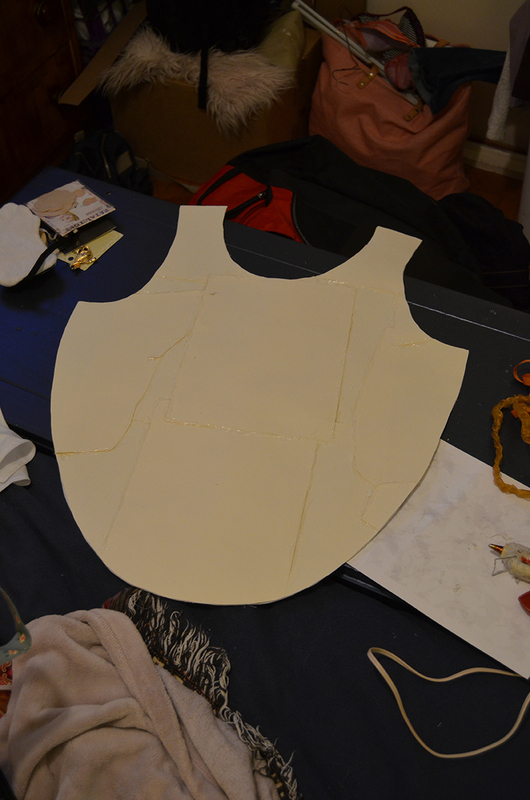 I wanted to make a chestplate and bracers for Erick’s armor. Ihough I’d originally planned to use actual ribbon, I was dissatisfied with the ribbon selection both in my ribbon drawer and the craft store, so I decided to use paper instead. That was also quite a bit less expensive, so double win! 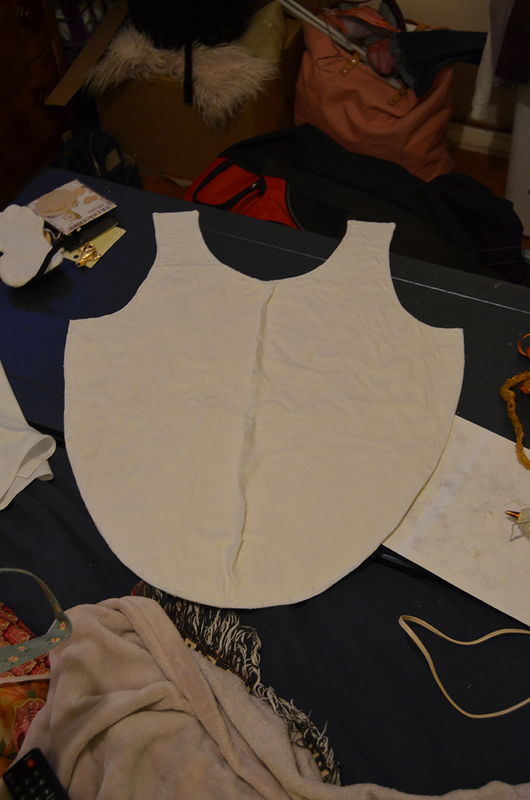 For the chestplate, I stared by gluing two layers of cardstock together to give it a firm, stiff base, and covered one side in muslin for a more “polished” finish. Matching up cardstock and fabric shapes. Cardstock back of the chestpiece. 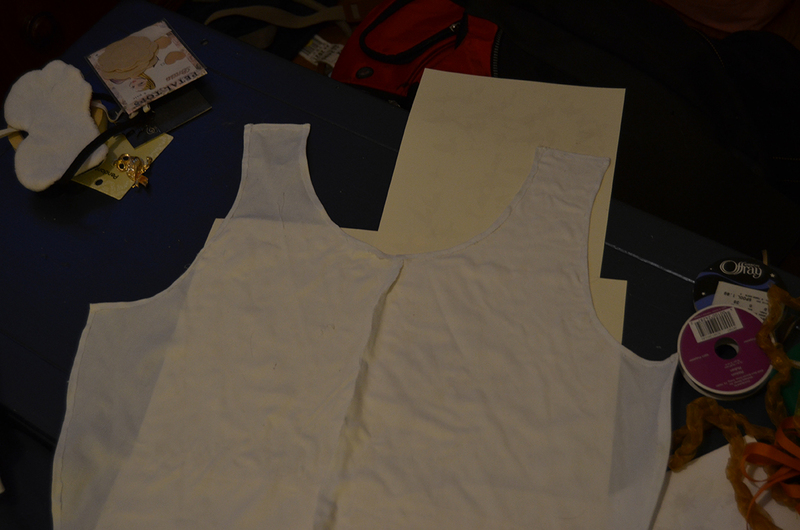 And fabric front, with a slight seam down the center to help shape it. You can see my black and red suitcase on the floor, which just shows how hurriedly I was trying to put this together before we left for our trip. 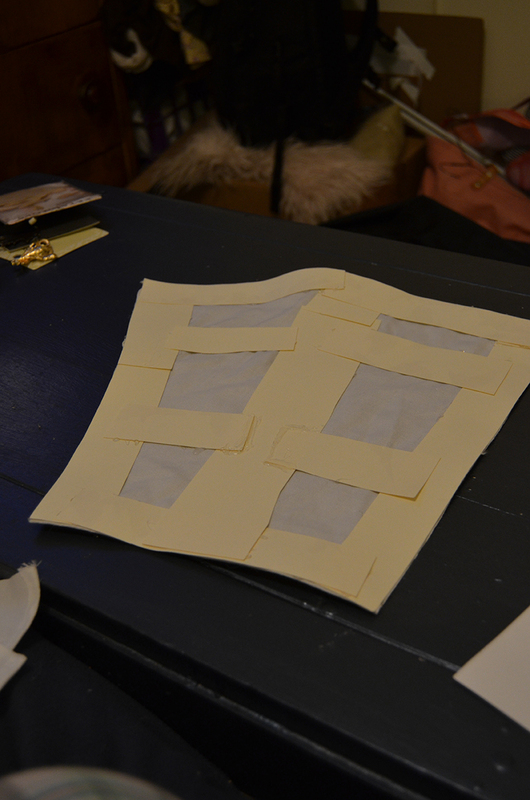 I got the bracers made too; fabric shapes with cardstock bones to give them sturdiness. I was planning on just tying the bracers on with ribbon, and I figured I’d do the same for the chestpiece since you wouldn’t be able to see the back or sides anyway, so the problem of keeping them on was easily solved. At this point, we really had to leave, so I just cut lengths of paper and used my rotary cutter to slice nice, straight even strips into them. I packed my glue gun and other supplies I might need and we hit the road. Our time visiting family was short, so we decided to shoot right after Christmas. I spent one long afternoon of our trip bent over the chestpiece and bracers, hot gluing the ribbon strips to them as quickly as I could. I alternated the colors, types and thicknesses the papers frequently to give it more depth, using cardstocks, vellum and tissue paper. Unfortunately, I was so busy feeling stressed about getting it done before the shoot the next morning, I completely forgot to take photos of the gluing-on process. But you can probably imagine what a slightly-crazed woman wielding a glue gun in one hand, paper ribbon strips in the other, muttering dark curses under her breath, hunched over fabric/paper constructs and commanding the glue gun to heat up faster and just GLUE looks like. The morning of the shoot came, and I’d managed to finish the costume (though my lower back was still complaining from having hunched for so many hours). I knew I’d be doing a lot of work to the cancer-monster in post, so I simply had one black trash bag bunched up into a ball which Erick could punch, and I’d made a very, very rough wire frame for another black trash bag into something that was somewhat wing-shaped. I scotch-taped the bags as needed to hold their shapes and let Erick pummel the central mass of the creature. Geoff helped tremendously with flipping the cloak and holding the wings up for me to photograph separately and composite into the final image. All said, it took perhaps half an hour. 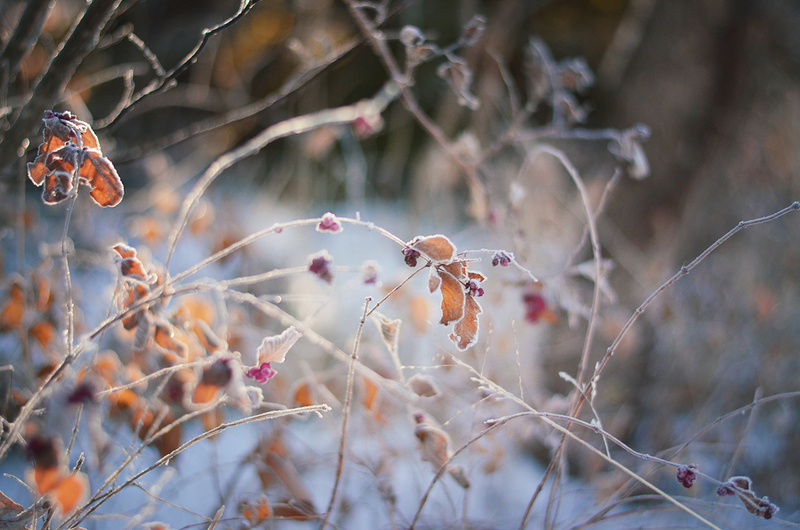 The park we were in was just beautiful and quite deserted given the very cold weather and early hour, and I couldn’t resist taking some snapshots of plants covered in jewel-like snow. I’ve said it before, but as a California-native, snow is UTTERLY MAGICAL to me whenever I encounter it. Erick looked incredibly noble and at home in his costume, and I’m so glad Geoff reminded me to take a portrait of him not in action. They’re quite different shots, but I think a lot of Erick’s quiet, inner strength and grace shows through, especially in the second portrait. After that, we all had a lovely breakfast at a local cafe and warmed up with hot food and coffee. A successful shoot! I hope these image can be an inspiration to others fighting their own battles; perhaps simply reminders to not give up quite yet. If you have had experiences with cancer or other long illnesses yourself, I would love to hear from you! I hope I can make the cancer community proud. And with that, let’s see the finished photos! This is not the time or place to get into it all, but it seems I will be heading into another of my own health battles, of the bureaucratic nature this time, and any well wishes and prayers would be appreciated!